Anabelle was born twenty weeks ago today. It amazes me how time continues to tick on by. The last time we were waiting for the twenty week milestone to arrive the weeks were going slowly, teasing us almost, in our wait to find out who our baby was. Twenty weeks today and it is so different to that last twenty week milestone. 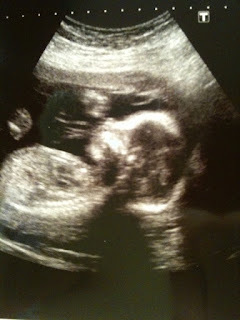 The last time we were celebrating twenty weeks was the 22nd March 2010 – the day of our scan. We had gone into the scan with names and knew our baby would be coming out of that scan as a person. Our baby was a girl, our baby was Anabelle. It was a beautiful day, I was so excited we were having a girl I was almost bouncing! We spent the evening visiting Anabelle’s grandparents and sharing Pink Champagne with everyone for our beautiful pink baby. Today, I feel so sad, there will be no champagne. What do we have to celebrate? I cannot believe half a pregnancy has now passed in time since her birth. It is twenty weeks, again on Monday. Incidentally her scan was also a Monday. Named on a Monday, born on a Monday, twenty weeks passed today on a Monday. Anabelle really is a Monday’s Child! Monday’s child is fair of face. Oh how true that rhyme is with regard to our daughter. Our beautiful girl. It was our twenty week scan that made me decide that Anabelle was going to have her Daddy’s nose. It was so clear from her profile. She was always going to be Daddy’s girl! Looked like him and spoilt by him from the word go. The day after our twenty week scan, Jon went to visit Mamas and Papas in his lunch hour. He wanted to buy Anabelle her big letter “A” to celebrate her name. It was put on top of our cabinet along with her new scan pictures in their frame. She was already such a part of our family, and in our naivety we just believed all we had to do was wait another twenty weeks for our daughter to arrive. The mere possibility of our daughter dying did not cross our minds. The Saturday after our scan we spent the day shopping for our daughter. Together we chose her first dress. It is a beautiful yellow and white dress with pink roses, with matching yellow ‘knickers’. Feminine and beautiful just like our daughter. Anabelle never got the chance to wear her first dress. Instead it will remain forever unworn and in her box. It saddens me that twenty weeks will never be such a pure joy again. That the excitement of finding out who our babies are and naming them will be tinged with the fear of losing them too, that we will have to force ourselves to go and buy the first dresses or outfits and toys so that our babies are all treated the same. When we first found out were pregnant I wanted a surprise baby. Jon on the other hand was adamant that we were going to find out. So we compromised. We would find out for our first child on the condition that for our second I could have a surprise. Never will I have a surprise baby now. I wouldn’t want a surprise now. All our children will be named at their twenty week scans. People have said to me “What if you change your minds on the name when your baby is born, what if their name doesn’t suit them when they are born?” – but I know that simply would not happen. Anabelle was named and she became that baby to us; it was her identity. You don’t change people’s identities when you know them like we knew Anabelle. People are their names. Anabelle was who she was when she died, named, a real person, an identity, not just ‘the baby’. I cannot imagine how much worse everything might’ve seemed without a name. I don’t know if I could’ve handled having to find out if our sleeping angel baby was a boy or a girl after birth, then having to decide on a name when everything was so painful, when everything was such a blur. I could not and would not put ourselves in that potential position by having a surprise for our second baby after Anabelle, just in case the worst was to happen to us again. Just another example of how the innocence of pregnancy has been taken away from us. Surprises are no longer an option. Names are important. Twenty weeks is important.